During these cold, winter months I really feel the need for some wholesome, warming food and this soup certainly hits the spot! Play around with the amount of lemon juice you add as 2 lemons can be too lemony for some! This recipe is taken from my January Reboot Challenge programme which is a 6 week healthy eating and fitness programme ( You can do the healthy eating as a stand alone programme or add in the fitness too). The programme will show you how to eat healthily for the LONG TERM to maintain optimum health and well being whilst still enjoying your food- no faddy diets, restrictions or calorie counting! This is also totally for you if you want to reset your metabolism for fat burning, get back into shape after the festive season, restore energy levels and kick the sugar cravings! A brand new January Reboot Challenge Support Pack, including family-friendly flexible meal plan, simple tasty breakfast, lunch, dinner and snack recipes. This includes vegetarian/vegan options. A private Facebook group with live access to nutritional advice and support from myself . Here, I will be able to answer any questions you may have on a daily basis. And I will also be posting weekday nutrition and motivational tips, to keep you focused and on-track each week. 3 body composition analysis sessions with me at the beginning, middle and end of the program to track your progress - this will be with a Tanita medically graded machine, (as used by Dr Ranjan Chatterjee on BBC 1's Doctor in the House.) This machine will measure body fat percentage, visceral fat, muscle mass and metabolic age, with a high degree of accuracy. This can be a great motivational tool whilst you are on the program and can see improvements in your data. Contact me on email@marcellerosenutrition.co.uk or 07961166582 to book or find out more! 6 Easy Steps to Beat the Party Season Bloat! We’re all prone to a little indulgence during the festive season, but rich food and overeating can play havoc with your digestion, leaving you bloated and uncomfortable. It’s not surprising – we consume on average 6,000 calories on Christmas Day alone. That’s three times the recommended daily intake for women! You often eat more than you usually would, putting pressure on the digestive system. You might be drinking a lot more when you eat – whether it’s prosecco at a party or red wine on Christmas Day – and this dilutes stomach acid, making it harder to properly digest your food. More rich, creamy foods than you’re used to can trigger heartburn or reflux or else make IBS symptoms worse. Though festive food and drink can be tough on the digestive system, it doesn’t have to be this way. Just follow my expert tips to trouble-proof your tummy this Christmas. The first step in the digestive process is often overlooked, but it’s a really important one. Known as the cephalic phase, it’s triggered when you see or smell food. You are literally whetting your appetite. When you start thinking about the lovely meal you are going to prepare, you are getting your digestive juices flowing. The enzymes in your saliva help you break down your food more easily, so, when the time comes, your body is actually ready to start digesting food before you have even cut the first slice – never mind actually put anything in your mouth. It may sound an incredibly simple step – and it is – but these days we are often so busy that we don’t make the time to think about our food in this way. If you find you’re always eating on the go, throwing a sandwich down your neck at your desk or having a TV dinner TV, this is a vital step you are missing out on. 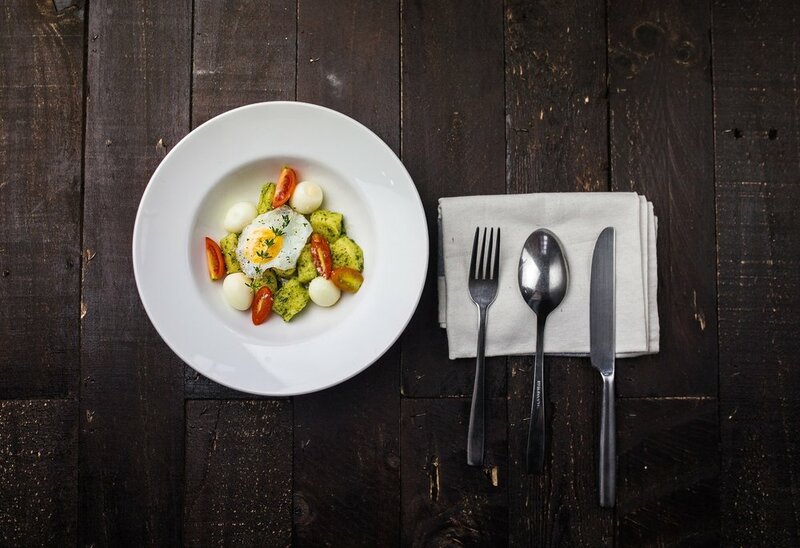 One trick is to be mindful and try and spend a few minutes thinking about your tasty lunch before you eat it to get the digestive juices going. Remember what Mum used to say? Well, she was right! Chewing your food (the second phase of digestion) is key when it comes to good gut health. With proper chewing, you are mechanically breaking down the food into smaller pieces, so that there’s a greater surface area and the digestive enzymes can get to work more easily, doing their job. And the bad news? If you’re not chewing properly, it’s highly likely that you’re not digesting your food properly. And that means you won’t be absorbing the vital nutrients either. Not chewing also means the food you eat takes much longer to break down, and, as it hangs around in your digestive system, it can start to ferment, causing uncomfortable wind, gas and bloating. Don’t worry about chewing a certain number of times – that all depends on what you are eating and various other factors. Instead try this test: chew your food enough so that if someone asked you to spit it out, they wouldn’t know what you had been eating. Another sign you need to chew more is if you start to see undigested food in your stools. Sales for heartburn tablets are skyrocketing because so many people wrongly assume that their digestive troubles are because of too much stomach acid. What nutritionists like me find more frequently in clinic is the total opposite! Getting older, stress and some over-the-counter medications can make your stomach acid levels drop to the extent that you don’t produce enough to digest food sufficiently. Why is this important? The stomach acid you produce not only kills any bacteria in the food you are eating, it also breaks down the protein in your meal. If you’re not properly digesting the protein element in food, it can start to ferment, creating gases that force up the esophageal sphincter muscle (a type of muscle flap) and what little stomach acid there is can escape. So the burning feeling, especially if accompanied by smelly gas, can be a sign your digestion isn’t working as well as it should be. One solution is to have a teaspoon of apple cider vinegar before each main meal. It’s important you choose apple cider vinegar with ‘mother’, rather than one you can buy in the supermarket (that’s for your chips). There are people who genuinely produce too much stomach acid and, if you try the apple cider vinegar trick and it seems to make things worse, you can neutralise the acid by taking a little bicarbonate of soda. Digestive enzymes break down our food into nutrients so our bodies can absorb them. But as we age, we naturally produce fewer of these helpful enzymes. You can counteract this by increasing your intake of foods that are higher in them – eating pineapple or papaya before a meal can help. If you aren’t a fan of these fruits, instead try a digestive enzyme capsule (available from health food shops), which will give your system a gentle boost to help it do its job properly. It’s important to space out your meals so the digestive system actually gets a chance to rest. This might require some self discipline, if your house is routinely full of bowls of nuts or towers of chocolate boxes. Eating every 4-5 hours is a good benchmark to aim for, and gives the body enough time to completely digest the previous meal and have a break before you put it to work again. Of course there will be days when your eating routine falls out of whack, but don’t beat yourself up. Just try and get back on track the following day. When you walk shortly after you’ve eaten, magic starts to happen. To start, a gentle walk lowers your blood sugar levels, so your body makes less insulin. As insulin is the fat-storage hormone, taking a gentle stroll for 15 minutes makes you less likely to store fat and gain weight. Walking can also help you digest your food better, according to research. This is because a gentle walk increases the speed at which the food moves through the digestive system. The World Health Organisation estimates that more than 300 million people suffer from depression and 260 million are living with anxiety disorders worldwide, many of these people live with both. As It is World Mental Health Day today , I wanted to share some simple dietary musts to optimise your mental health. A diet high in refined sugar and processed foods can cause mood swings, low energy and inflammation as well as low immunity and poor digestion. All of these issues can have a negative impact on mental health. Refined sugar and refined carbohydrates do not supply us with nutrients and will spike our blood sugar levels, furthermore they will use up the mood-enhancing B vitamins, which are needed to convert the sugar into energy. EAT A PORTION OF LEAN PROTEIN WITH EVERY MEAL. When we eat protein it is broken down into amino acids. These amino acids are used to make the brain's chemical messages, essential for the nervous system to work effectively. The neurotransmitter serotonin ( known as the 'happy hormone') for example cannot be produced by the body without the amino acid tryptophan. Dark green leafy vegetables such as spinach, rocket, kale, chard, watercress and broccoli are high in folate. Deficiencies in this vitamin as with other B vitamins are associated with higher rates of depression, insomnia and fatigue. We must obtain omega 3 fatty acids from our diet as our body cannot produce it by itself. The best sources of omega 3 are oily fish e.g. salmon sardines, anchovy’s mackerel and herring. Omega 3 fatty acids are also present in flax (linseed) and chia seeds. The seeds should be ground to benefit from their omega 3 content. Omega 3 fatty acids from seeds and nuts need to be converted by the body to the form that the brain can use (DHA and EPA). Some people lack the specific enzymes to be able to make this conversion effectively. If you do not regularly consume oily fish, consider supplementing with a good quality Omega 3 fish oil supplement which has been tested for its purity. Vegan/vegetarian omega 3 supplements containing DHA and EPA, can also be obtained which are derived from algae. 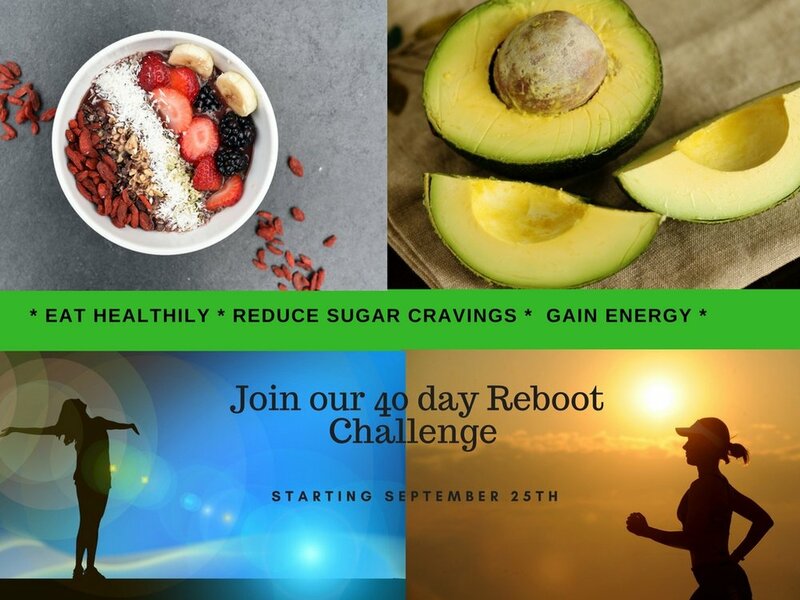 The Reboot Nutrition Programme will reset your metabolism and reboot your body after the ice creams and mojitos of the summer! Accessible anytime, anywhere, via a Facebook group, this is a virtual programme which you can manage to suit your busy schedule. I will guide and support you through the programme and you will learn how to eat healthily for the long term whilst still enjoying your food. ✅Membership of a private Facebook group for 24/7 expert support and motivation. I will be able to answer any questions you have and will be posting daily nutrition and motivational tips, to keep you focused and on-track each week. ✅A one-to-one 20 minute Discovery Call with me. You will be able to discuss any health and nutrition/dietary concerns that you may have. This Discovery Call can be booked in at any time that is preferable during your programme. ✅More energy, reduced sugar cravings, weight loss, fat loss!! One of the first steps to tackling sugar cravings, is to ensure you are eating enough of the key sugar balancing nutrients within your diet. Chromium is one of these special nutrients. It’s a mineral found in small amounts in many foods, however approximately 56% of the population is at risk of being chromium deficient. Read on to discover the top chromium food sources, why chromium is so important for our health and a super- simple chromium rich recipe! Pour 40g of porridge oats in a saucepan and add 300ml of water, coconut milk, almond milk or organic milk. Bring to the boil and simmer for a few minutes stirring continuously until it is the right consistency and serve into a bowl. Add half a grated apple, half a sliced banana and sprinkle with cinnamon. If you’ve been following me on Facebook in the last week you might have noticed there’s been a bit of a theme going on – digestive health. If you have stuff going on ‘downstairs’ it can be a nightmare for sure. You really need to check out what’s in my brand new online programme; The 21 Day Digestion Rescue Plan at a brilliant no-brainer price of just £29. This is totally for you if you… Struggle with constipation or diarrhoea, cramps, bloating or belching, or if you’ve been wondering whether you might have some kind of food intolerance. And it’s also for you if you suffer from hayfever, eczema or other skin conditions, any kind of auto immune condition and more besides. The 21-day Digestion Rescue Plan is part information, part diet plan and it's designed to help you optimise your digestive health and improve your symptoms. It will also help you understand what other factors might be impacting on your symptoms and which tests might be relevant for you to consider. The programme includes all you'll need to make an informed decision about what might be going on for you PLUS 21 days of easy-to-prepare meals and snacks for you to enjoy. If you like what you see, click the link below and sign up and lets get you started! Disclaimer: This course is not intended as a replacement for medical advice in any way. Always check with your GP or nutritional Therapist before making big changes to your diet or taking new supplements and if you have any concerns about symptoms. There are some symptoms you should always seek advice regarding. These include the following: persistent unexplained pain, unexplained bleeding or discharge, blood in vomit or stools, inability to gain or lose weight, loss of appetite, unexplained weight loss, fissures, black tarry stools. 7 surprising reasons to include vitamin K rich food in your diet and how to do it! Vitamin K is a fat soluble vitamin, meaning that you need to include healthy fats in your diet to effectively absorb it. It’s found naturally in plants, however vitamin K2 is produced in the gut by your healthy bacteria! And this is why we need it! 1. Vital for blood clotting (this process is essential to stop bleeding). Vitamin K is required for some of the clotting factors in our blood to work effectively. 2. Crucial for building strong bones. Deficiencies in vitamin K are associated with a greater risk of fracture. This is particularly important for women going through the menopause to bear in mind. 3. Promotes healthy arteries and protects against cardio-vascular disease. Vitamin K has been shown in studies to protect the cells that line our veins and arteries. 4. Important for brain cell repair, hence helping to optimise our memory and concentration and prevent cognitive decline as we age! 5. Supports pancreatic beta cell function and therefore insulin production. Scientific studies have indicated that vitamin K can improve insulin resistance and therefore reduce the risk of diabetes. 6. Anti cancer properties; studies have found that vitamin K may be helpful in fighting a number of different cancers. 7. Reduces wrinkling of the skin and premature ageing. It’s believed that vitamin K prevents calcium from being deposited in your skin’s elastin fibres which can harden to cause wrinkles. 10 reasons why we need iron in our diet and how to include it. Iron is one of the best known minerals and can be obtained from many plant foods as well as animal products. It is vital to have the correct balance of iron in our diet. Many substances and health conditions can inhibit how we absorb iron. Conversely, there are a number of nutrients that will increase our absorption of iron. As iron is not easily eliminated, high levels can build up in the body. It is therefore essential to have your iron levels checked regularly if taking an iron supplement. Do you over-do the chocolate eggs at Easter? Places will be limited to ensure I can support you in the best way possible. Tryptophan is one of the amino acids that cannot be made by the body and must be consumed through diet.